It feels traitorous to review The Physics of Sorrow like other reviews—so I won’t. I won’t review Physics of Sorrow as I’d normally review a book because Physics of Sorrow is unlike any book I’d normally review. But in the interest of clarity, here are statements I would (more or less wittily) otherwise cover within the first paragraph, without the mystic codes of the literary reviewer. 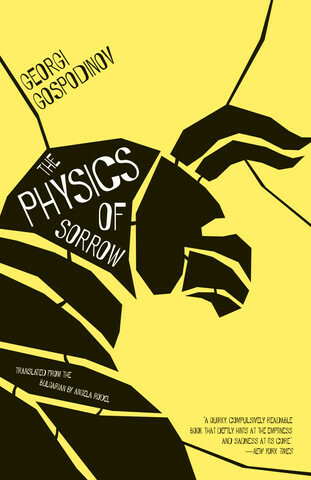 The Physics of Sorrow was written by Bulgarian writer Georgi Gospodinov in 2011. Open Letter Books published it in translation (by the eminently talented Angela Rodel—more on this later) in April 2015. In Bulgaria, the book was a runaway bestseller. It won practically every Bulgarian literary prize there was to win. It was also shortlisted for several prestigious European prizes, such as the Premio Strega and the Europäischer Literaturpreis. The Physics of Sorrow is an excellent book. Do you remember the Minotaur? The Minotaur figures heavily in The Physics of Sorrow (he’s even on the cover). Here is a reminder: the Minotaur was borne of bull and woman and may be natural aberration, but he is no accident. He is maligned all his life and ultimately murdered in his hiding-place, the labyrinth. And according to Gospodinov, the Minotaur is also innocent. He did not ask to be born, nor did he ask to seethe as a child in the labyrinthine basement in 1980s Soviet Bulgaria—as he does here—or as bullied spectacle in a traveling circus. The Minotaur was borne of a curse—born cursed, too—and has no choice but to moan (“Mooooooooo”) for comfort, love, security, a mother (“Mooooooommy”). Evoking a myth is nothing new. Still, in The Physics of Sorrow, the Minotaur is more than allegory and his story is not co-opted, but consumed. Austere, trapped, virtually mute, the Minotaur is not metaphysical. His hunger for comfort and his untranslatable sorrow are both real and infectious. The Physics of Sorrow is littered with tiny narratives needling one another (that of the Minotaur is but one of these). They remind us that we use stories to sustain ourselves-as-such, and that these stories can also unravel us: a bike crash in Finland, a mysterious story-selling scammer, a group of Roma people harvesting chamomile in the airport, a list of recommended laundry for a young army recruit. It’s lazy to suggest that the book “subverts notions of time and narrative,” and I hope I can convince you it does far more than that. In fact, it does not subvert any such concepts. I’d say that despite its distance from realist fiction, it feels more intimately real, more sensual, more historical, and saner than any other contemporary fiction I have read this year or last. In its magpie-like cataloging of images, recollections, histories, data, and text, it feels like how I remember to be a person. The novel performs rather brilliantly how we become the bodies (historical, material, imagined) we’ve been told about. We consume these bodies like particles in a sort of quantum hybridity (the novel knows it, too, cataloguing “The devoured Children in Greek Mythology,” wondering, “if we agree that antiquity is the childhood of mankind, then why is that childhood so devoid precisely of children?”). The Physics of Sorrow defines identity as we articulate our trains of thought. How we become what we think about. How we’re forced to think long before we begin being. “We” is the operative pronoun here. The story begins impressively: “We am.” And in The Physics of Sorrow, the tangled loneliness of the narrator/Gospodinov can only be attributed to the collective. The Physics of Sorrow may not be conventional—“conventional” as many English-language readers have come to understand the term—but that does not mean that it is not marvelously readable. This is not a tedious text because it does not observe or describe its universe: it creates it. As a translator myself, I am all-too aware of how untranslatable a certain sorrow may be. I am also aware of the problems an English-language translator encounters when faced with a text that finds no easy English-language analogue. And this makes the novel all the more exciting: The Physics of Sorrow is immersive, its streams-of-consciousness not tedious, its sentences funny, bright, and alluring. I know I am not reading a text originally written in English, but instead of a chore it is a delight: this book could have been disastrous had it landed in the wrong hands. Angela Rodel’s are most decidedly the right ones. “There is some sort of grammar of aging,” the narrator posits near the end of the book. “Childhood and youth are full of verbs. You can’t sit still. Everything in you is growing, gushing forth, developing.” The same could be said of the book, so effervescent with energy it seems poised to snap.